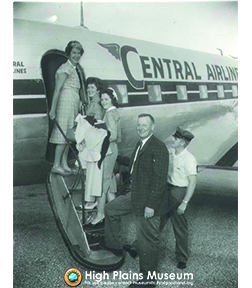 The photograph shows the dedication of the Central Airlines Service into the Goodland Airport in 1960. On the top step we see Marjorie Cogswell, followed by two unknown women and the man is Mayor John Cogswell. Named after Dr. Renner for his prominence in the flying community, today Renner Field no longer offers passenger service. The airport does still have a restaurant and offers services to pilots. ← Aren’t You A Dandy?